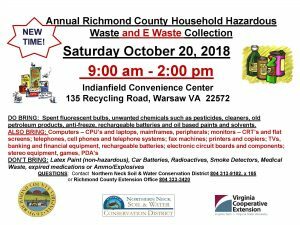 The Richmond County Household Hazardous Waste and Electronics Waste Collection will take place Saturday, October 20, 2018 from 9 am until 2 pm at the Indianfields Convenience Center, 135 Recycling Rd, (off of 360), Warsaw, VA. Richmond County residents are invited to bring their old oil based paints, old petroleum products, pesticides, spent flourescent bulbs and CFL bulbs, plus other hazardous chemicals to the collection. This marks the first all day collection event for Richmond County. The county has also added an Electronics waste collection to the event. 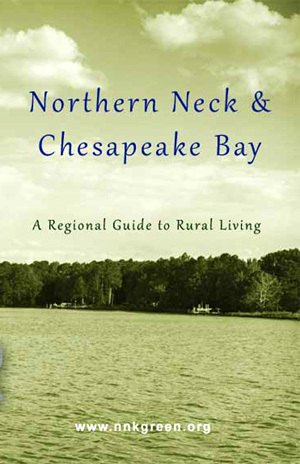 Residents can bring old televisions, monitors, computers, rechargeable batteries and other electronics and there is no disposal fee! This event is limited to Richmond County residents/private households (no business waste please). Please, no tires, car batteries, medications, latex paint (latex paint is not hazardous and can be dried out and disposed of in the garbage). Also, please don’t bring radioactives, ammunition, or other explosives.